Located in trendy Christianshavn at the end of a converted warehouse pier, there is no possible way you could even stumble upon this restaurant. The area is not built up commercially nor residentially and after driving through dimly lit empty streets for a few blocks, just as I was about to question if we were lost, the taxi suddenly stopped and our driver pointed to a dimly lit warehouse and announced ‘over there’. ‘Over there’ is where we spent the next 4 hours ‘foraging’ through 8 ‘snacks’ followed by 12 courses with wine pairings. 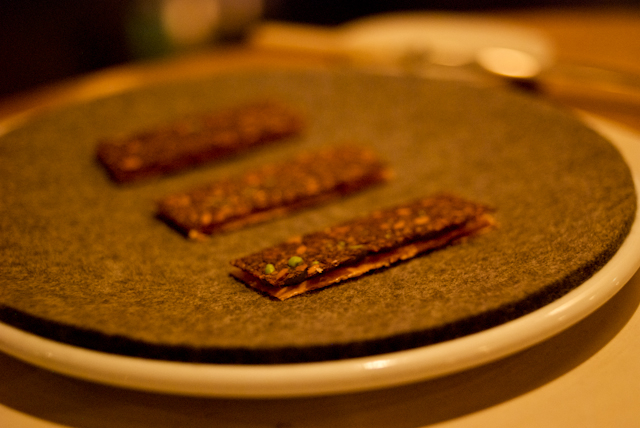 Part I will review the 8 courses of ‘snacks’, part II (coming soon), will review the actual Noma Nassaq 12 course menu. The ‘process’ began quite a few months back. Being Sam’s 30th this year, I wanted to take him somewhere special and his heart was set on Noma. 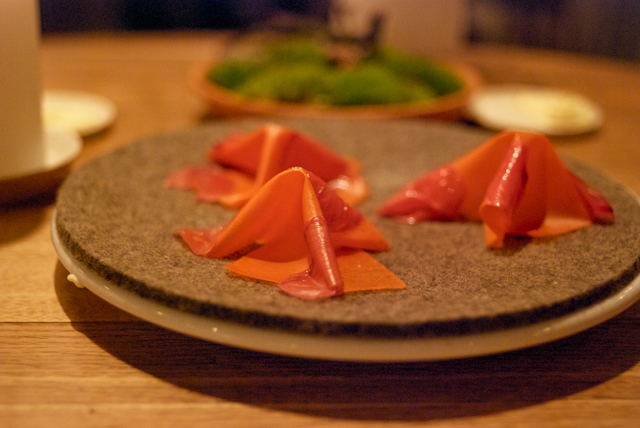 Noma has a unique policy where it takes bookings 3 months prior on the first day the month, for bookings for that entire month. So unlike say somewhere like The Fat Duck where bookings are taken for a single day only, you are essentially competing on phone lines with people who are booking for the whole of that particular month. With lines opening at 10am Denmark time, I was poised next to my phone (automatic redial on Skype) at 9am GMT. Fortunately, Noma are also set up to take online reservations and after 22 panicked minutes of simultaneously refreshing and redialling later, I managed to confirm my reservation for a table for 3 on Saturday 4th December 2010. The day of Samson’s 30th birthday. There are no words that can describe how elated I felt at that moment. With flights booked ex-Gatwick, the stress began early in the week when early December snowstorms crippled Surrey. A closed Gatwick airport meant no flight, which ultimately meant no Noma. In the days leading up to our flight, I must have checked a combination of the Gatwick Airport website, Gatwick express website, MET weather website at least once an hour. Luckily the skies opened on the eve of our booking, and whilst delayed, Sam and I were almost in tears as we took off. One dining companion flying ex-Heathrow was too caught up in delays and actually only made it to Copenhagen an hour before our reservation. If you were lucky enough to already be in Copenhagen last week, apparently it was a good week to score a last minute bookings as the restaurant told us that multiple reservations from England had been cancelled due to the weather. How my heart would have hurt if that were me! The restaurant is simple. 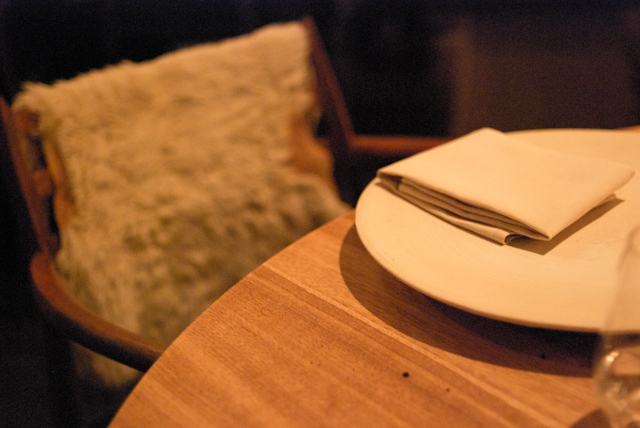 Bare wooden tables, beautifully designed chairs with only a rustic fur blanket as decoration. The lighting is rather dim, and the restaurant cosy and warm, which helped make the large, empty space feel more welcoming. Welcoming too was the reception that we received when walking inside the restaurant. At first the Maître’D couldn’t find our reservation (I almost had a heart attack!) but Chef Rene lurking in the background came to our rescue and found my name on the list. Widely praised and at the young age of 32, Rene Redzepi still has a slight boyish aurora about him. When he speaks he is quiet, yet articulate but interestingly he comes across as rather shy – almost as if he would prefer to be lurking in the kitchen, not meeting and greeting guests. Uniquely our waiter is also our sommelier and what makes Noma even more unique is that the chefs serve as food runners. Having chefs bring out and describe each dish is rather interesting and you really get the opportunity to understand the passion and process involved in creating each dish. The chefs too speak fondly of their weekly foraging expeditions, though at the present time due to snow, this is currently being outsourced to professionals. Before being handed the menu, Noma offers diners a series of 8 or so ‘snacks’ – a degustation of amuses if you will. 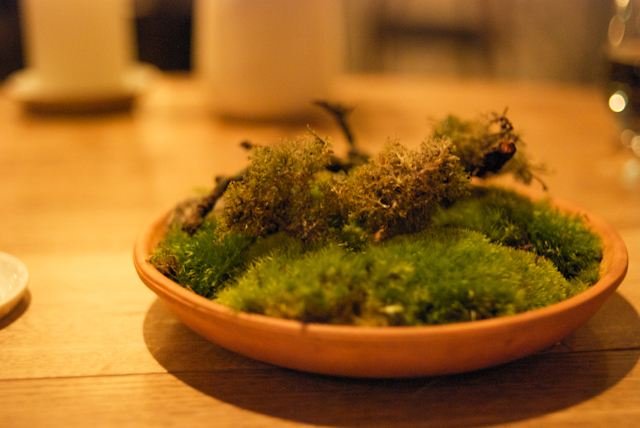 All eaten by hand, the snacks are designed to capture the essence of Noma – clean, natural, fresh food; all in one bite. 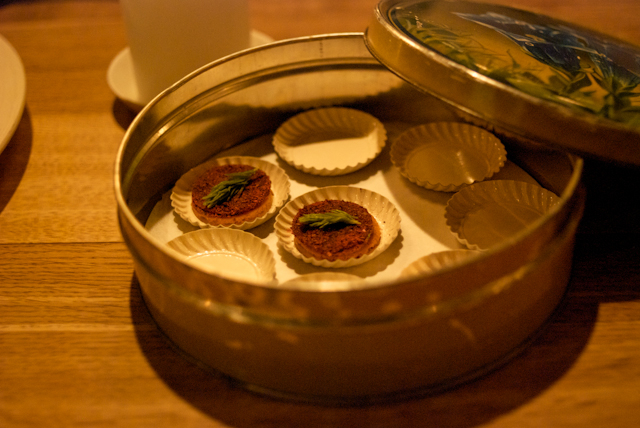 Snack 2: Sea-buckthorn leather with pickled rose hip petals. The leather is essentially berry puree that has been dried into paper-thin strips. The result is a tart, yet crisp film with a taste not dissimilar to asian haw flakes. The rose hip petals that accompanied the dish had been picked during the summer and pickled to be consumed during the winter months. The harmony between the flavours are no coincidence as both buckthron berry and rose grow side-by-side in Denmark where they were foraged. Snack 3: Leeks deep-fried with garlic puree. 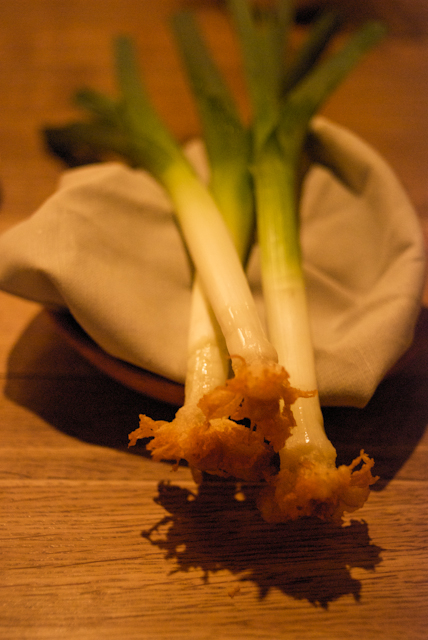 Next we were served stalks of baby leek which had been cooked only at the ends. We were instructed to take only a bite of the sweet leeks, which had been coated with a bit of garlic puree. The stalk was creamy and sweet and roots crispy fried. A perfect bite of food. Snack 4: Savoury cookies with speck and blackcurrants. A biscuit tin was presented to us, which we were instructed to open up. Inside we found three small savoury bite-sized cookies. The blackcurrant flavour was rather tart and speck layer smokey. Not my favourite dish but a perfectly fine bite of food. Snack 5: Toasted rye bread sandwich with chicken skin, smoked cheese and fava bean cream. This snack was really quite special and I can only describe it as the most gourmet ryvita snack I have even eaten. The rye bread top was crisp with slight perforations to allow the sweet, smooth fava bean cheese to squeeze through. The crisp chicken skin base wonderfully fat-coated the base of my mouth and bringing richness to each bite. Texture and taste. A winning combination. Snack 6: Pickled, smoked quail egg. 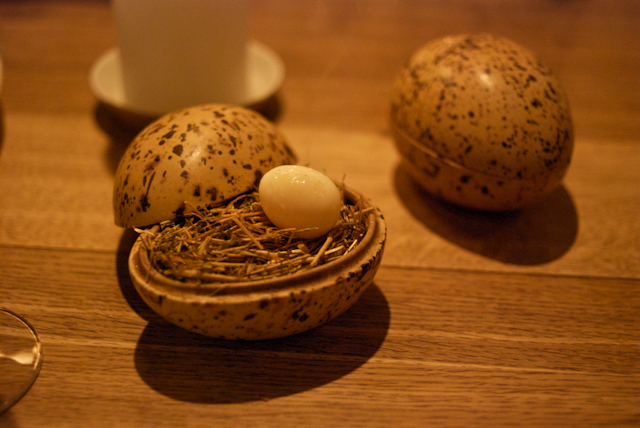 One of Noma’s signature dishes, lightly hay smoked pickled quail eggs were presented to us in a ceramic egg resting atop a bed of hay. One of the biggest highlights of the evening was opening up the ceramic egg and taking in the smoky aroma. The egg itself was soft to the touch, richly runny in the yolks with just a slight smoky flavour. Snack 7: Radishes & Carrots in soil. A small terracotta pot was presented with what appeared to be weeds growing from it. 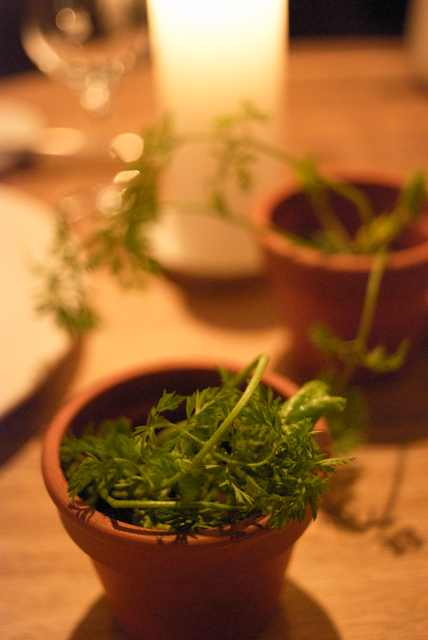 In fact, we soon found out they were raw radishes and carrots and should be consumed stalk, dirt and all. The ‘soil’ was made from hazlenuts and crushed malt, which dusted the vegetables coated with a yoghurt and tarragon mixture. The carrots tasted like carrots and turnips like turnips. Refreshingly raw. 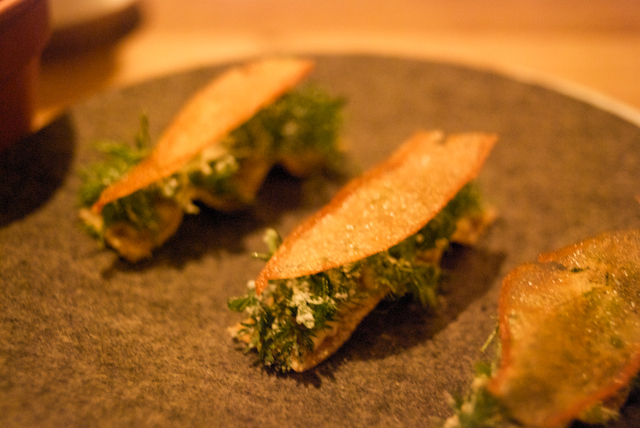 Snack 8: Herbs, flower and duck fat crisp. A thin wafer sandwich topped with herbs, flowers arrived next. We quickly discovered that the top layer was in fact a duck film made from fat in a duck broth. Crisp, fatty and just downright tasty, the skin was intensified by a rich smoked scallop roe emulsion that was squirted atop the herb scatter. My absolute favourite dish of the evening combining freshness from the herbs, richness from the duck fat and overall just delicate. 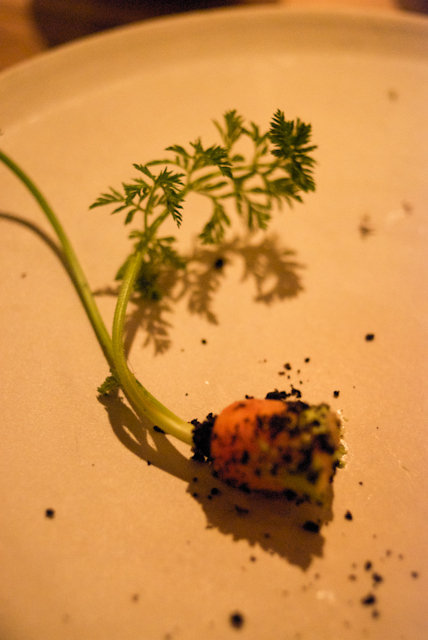 To be continued… Noma Nassaq 12 course menu to follow in Noma Part II. This entry was posted in Outside UK Restaurants and tagged Copenhagen, Denmark, Fat Duck, food, foraging, Noma, René Redzepi, restaurant, restaurants. Bookmark the permalink. Can’t wait to read the rest….it looks really delicious so far! Food miscellany from an Aussie girl who loves to cook but above all, lives to eat. Recent Posts on Food Fight. You may not copy or otherwise reproduce any of this material without prior written permission. All writing and photography copyrighted. All rights reserved. Copyright 2010.